January: Just the word conjures up the cold. If you’re not among the Atlantans who relish scarves, mittens and getaways to snow-covered climes, you may be ticking off the days until summer returns. But instead of daydreaming of warm breezes and sun-soaked landscapes, indulge your summer urge with a de-stressing getaway to a spot where those images come to colorful life. Start a spa visit with a Riviera Maya Water Journey. Few places within a short flight of Atlanta combine temps in the 80s with pampered coddling and five-star dining as well as Grand Velas Riviera Maya, a luxurious resort nestled between the white sands and the wild jungle of the western Caribbean. Though surrounded by nature, this property has tamed the elements, extending the water from the beach to the grand front entrance, where two scallop-shaped white walls soar out of bubbling pools. And its staff has mastered the art of meeting a guest’s every need, from printing a boarding pass to escorting guests to umbrella shaded beach chairs and plying them with exotic drinks and nibbles. The fine-dining restaurant Piaf was inspired by 1940s Paris and the singer Edith Piaf. The all-inclusive property offers designated areas for families and adults-only so guests can pick whether they want to bring the kiddies or not. In the grown-up area, the secluded beach is just a few steps from a slate blue pool, complete with swim-up bar and a smooth jazz combo that provides live ambience. The nearby dining room has views of the waterscape from a raised patio, but there’s no need to leave the comfort of the cushioned lounge chairs. The constantly circulating staff is happy to bring a table with lunch, snacks and mojitos right to your side. 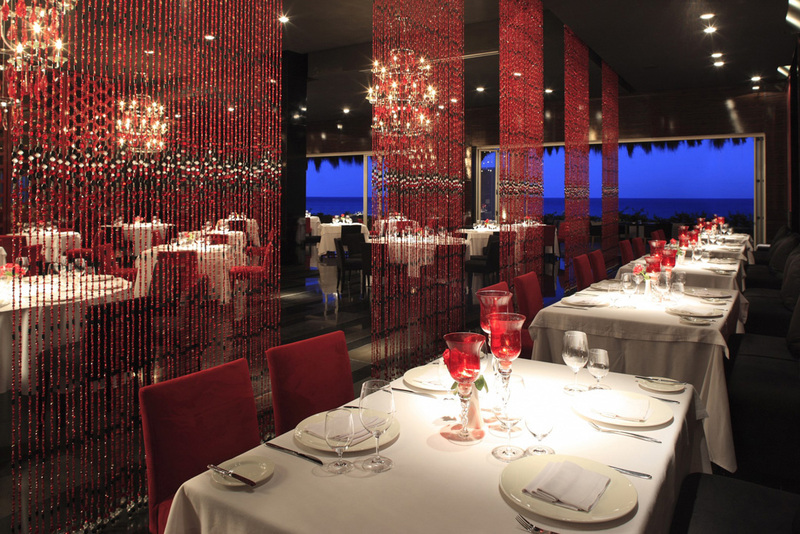 But don’t snack too much—leave room for a dining experience in one of Grand Velas’s upscale eateries. Select from classic French, Asian and Mexican, with a focus on local dishes created with indigenous ingredients. Don’t see something you’re craving? The kitchen crew treats the menus as mere suggestions: Just ask, and they make it happen. The jewel of the kitchen here is the Cocina de Autor, where Chef Nahum Velasco and his team present rather than serve a set menu with a minimum of 10 dishes, all perfectly paired with wines and beers, and served on artistically designed plates and platters. The scaled-down portions vary frequently, but you might find yourself savoring snails, duck with blueberries, veal with chestnuts or delicate, bite-sized ovals with thin shells that burst open with creamy avocado when you pop them into your mouth. Along with indulging the palate, Grand Velas excels at warming up those winter-weary muscles. The two-level, stone-and-marble spa holds enough experiences to last most of a day, so plan to linger for the full benefit. Start off with a warm shower followed by a stint in the steam room. Then, slather your pores with a variety of mud compounds and let them work their magic in the cold room, where each seat is outfitted with its own showerhead to rinse it all off. 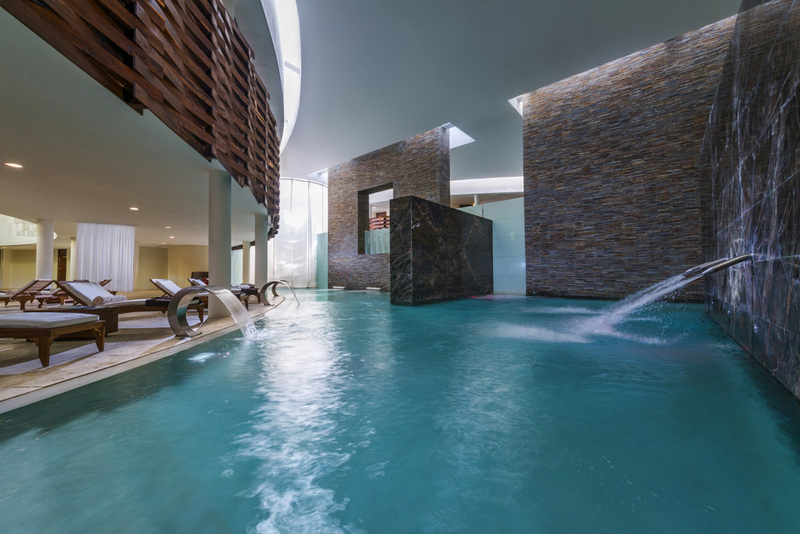 Head to a massage or facial, and keep the relaxing vibes going with a few minutes in the bubbling hot tub before finishing with a dip in the pool, where a variety of water sprays and jets keep the blood flowing. 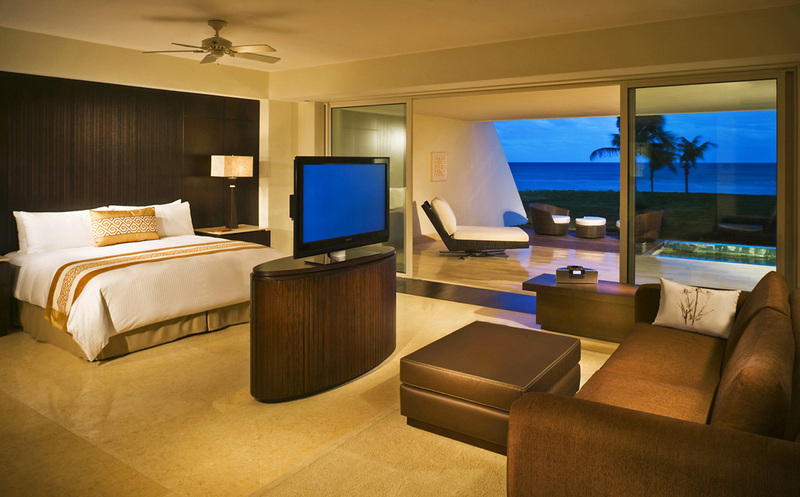 Spacious guest rooms have private plunge pools and ocean view terraces. The resort’s lavishly appointed suites provide a secluded spot where you can unwind in private. Loll in the oversized spa tub or the marble shower with multiple jets. Grab a nap on the balcony bed, and if the heat gets to be a tad too much, take a refreshing dip in your private plunge pool overlooking the beach. Along with a meticulously manicured property, glorious food and a sun-drenched beach, count the Grand Velas staff as an amenity as well. During a recent stay, they sat poolside and arranged airport transportation for guests who were cooling off in the deep end, and then met the challenge of repairing sunglasses that had lost a screw. The only thing they can’t do is make excuses to your boss for an extended stay in the sun.